Peruvian cuisine has been the hot new trend for the past two years and shows no signs of cooling. Lima now boasts two restaurants in the world's Top 50 list with more on the way. Tourists are now spending more time in Lima to enjoy the dynamic new restaurant scene. In this edition, we look at some of the top trends, star chefs and their restaurants—and even throw in a recipe to whet your appetite. 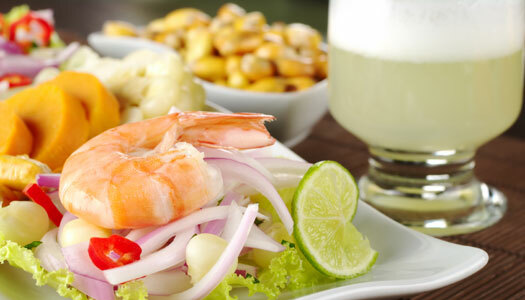 Peruvian cuisine really came on strong starting in 2012, named the "it" cuisine by Forbes. International celebrity chefs like Graham Elliot and Éric Ripert were presenting Peruvian inspired cuisine in their respective Michelin-starred restaurants. The National Restaurant Association named Peruvian food and beverage the top trend to watch in 2013. Meanwhile, in Peru, classically trained chefs began to experiment by incorporating traditional Peruvian flavors into their haute cuisine. The rest is history. By 2014, the Economist magazine mentions Peru's gastronomic revolution as "good business". The UK's World Travel Awards named Peru "the best culinary destination" for both 2012 and 2013. 2014 winners will be announced in November. At the epicenter of Peru's gastronomical revolution sits Gastón Acurio. A Lima native, Acurio forsook a law career to pursue his passion for food, studying at Le Cordon Bleu in Paris, where he met his future wife, Astrid Gutsche. Returning to Peru in 1994, the couple opened Astrid y Gastón. Initially French haute cuisine, Acurio started experimenting with traditional Peruvian flavors, elevating them with the skills he acquired in France to help create what is now referred to as Cocina Novoandina. This year, Astrid y Gastón was named number 15 of the Top 50 best restaurants in the world. Acurio has since gone one to build a gastronomic empire of 33 restaurants in 12 countries. Following in Acurio's footsteps, fellow Lima native Virgilio Martinez enrolled at Le Cordon Bleu in London, graduating in 1998. In the following 10 years, Martinez apprenticed in some of the finest restaurants in the world, including New York's Lutèce, before returning to Lima to take the helm of Astrid y Gastón. In 2010, Martinez opened his own restaurant,Central in the trendy Miraflores neighborhood. This year, Central was named number 18 of the World's Top 50 restaurant, giving Peru bragging rights to two restaurants in the world's top 20. Other than Ceviche, Lomo Saltado is perhaps the most ubiquitous dish on the Peruvian menu. It is representative of Chifa cuisine—a fusion of traditional Peruvian and Cantonese cuisine, brought to Peru by Chinese immigrants in the late 19th and early 20th centuries. You can prepare Lomo Saltado at home using ingredients found in most supermarkets. If you do not have a Latin market nearby, a suitable substitute for aji peppers would be habañero or serrano peppers. Season the beef with garlic, salt and pepper. Put a wok or a pan over very high heat. Stir in oil and cook the meat, a few slices at a time (so they do not steam the meat browns). Cook about 10 minutes, depending on how high the heat. Stir in the onion, tomato, chili pepper, and stir for about 2 to 3 minutes. The tomatoes and onions should be crunchy, not mushy. Stir in soy sauce and vinegar on sides of wok or pan. Mix everything. Add beef broth and boil. Taste for seasoning. Turn off the heat, add chopped cilantro and serve at once with french fries and white rice. Select from several distinctive journeys or combine Peru with our signature Galápagos voyages.